And yet the undeniably wonderful aspect about that very far-out concept is that it permits contemporary man rather than future man the opportunity to engage with and confront the mysteries of the cosmos. 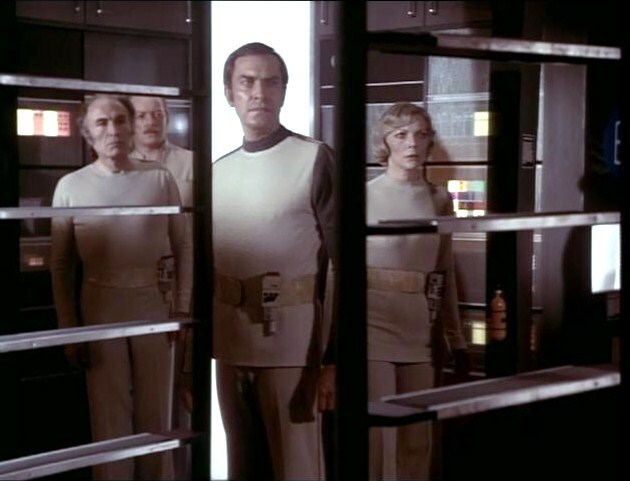 As I wrote in my book about the series, Exploring Space:1999 (1997) the powerful central notion of Space: 1999 is that it is us -- our generation, right now -- up there reckoning with the awe and terror of the unknown. As many 1970s articles described this idea, the Alphans of Space:1999 are "technologically and psychologically" unprepared for a space journey of any kind, and so have much to reckon with and learn about on their unplanned odyssey. An illuminating comparison involves Star Trek. In that (wonderful) franchise, man is the master of his destiny and master of the stars as well. In Space:1999, man is scraping to get by, to survive in a universe he isn't equipped to truly understand or countenance. Space:1999 was thus at its finest when the writers remembered their central conceit regarding the characters; that contemporary man, with all of his flaws and foibles, is at the core of all the storytelling. One impressive installment that plainly remembers this idea is Johnny Byrne's "Voyager's Return," directed by Bob Kellett. 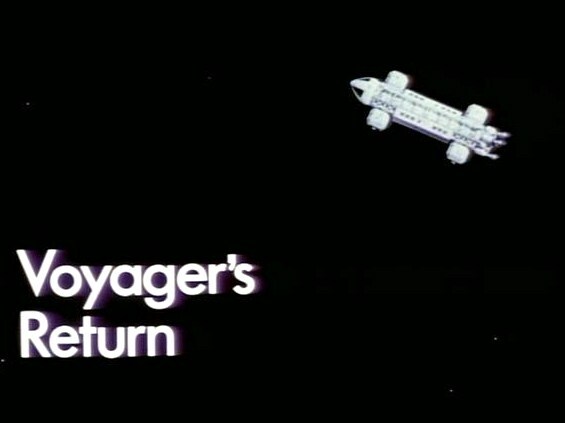 In "Voyager's Return," Moonbase Alpha encounters a technological terror of human design when the errant moon crosses paths with a Terran space probe launched in the year 1985. That probe, Voyager One, makes use of a dangerous interstellar drive called "The Queller Drive." The drive spews "fast neutrons" into space, and destroys all life that it comes in contact with. The Queller Drive has a spotted history. It kicked in too early during the launch of Voyager 2 (when standard chemical rockets should have been employed...) and the probe immediately killed two hundred people, including Paul Morrow's (Prentis Hancock's) father. Now, Commander Koenig (Martin Landau) must decide if he should destroy Voyager One and the Queller Drive outright, or attempt to commandeer the probe for its black box, which contains valuable data about the star systems the craft has visited. Ultimately, Koenig sides with Professor Victor Bergman (Barry Morse), over the objections of Dr. Helena Russell (Barbara Bain) and Paul, and sets about to tamper with the Voyager One so as to retrieve the crucial data. When Bergman's efforts fail, a scientist on Moonbase Alpha steps forward and reveals that he is, in fact, Ernst Queller (Jeremy Kemp), the despised and derided inventor of the dangerous drive system. 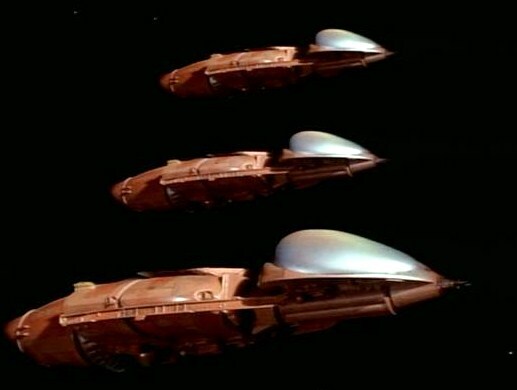 Queller believes that he can right the wrongs of long ago, and commandeer Voyager One before it endangers Alpha. Unfortunately, the Queller Drive has malfunctioned again. Voyager One recently passed into the territory of a race called the Sidons. There, the Queller Drive rendered lifeless two inhabited planets and now the Sidons are in pursuit of the "primitive" craft seeking their own brand of justice. At the heart of "Voyager's Return" are the issues of atonement, redemption, and even revenge. Dr. Queller desperately wants to make amends for the Voyager 2 accident, and contribute something positive as his legacy. Meanwhile, those around him -- again, examples of contemporary man -- judge him with harshness and anger. Morrow won't forgive him, or even accept his presence. And Queller's assistant, Jim Haines, lost two parents during the Voyager 2 accident. Jim physically assaults Queller at an inopportune moment, and his impulsive actions nearly cause the destruction of the base. Again, future man may be more evolved and peaceful, but contemporary man is passionate and irrational even when common sense indicates he should be otherwise. "We take a number of lessons from this episode. And one of them is that we are all governed by a universal principle: that our technology develops faster than our wisdom. Let me go back. I think this is a universal principle: the rate of a life form’s biological development is out of key with the rate of technological development. In a hundred years, we’ve advanced enormously in terms of technology, but we’re essentially the same fearful, passionate, mistake-ridden, aggressive, greedy, ego-driven creature. And there is nothing materially different in recorded history going right back to the Greeks. We are governed by the same kind of incoherent tribulations today as we were then. We really haven’t progressed." Again, this is a very realistic (as opposed to idealistic) view of mankind, and one of the things that, actually, makes us root so strongly for the denizens of Moonbase Alpha. They weren't born into paradise and prosperity. They don't possess an endless supply of resources. They haven't colonized a thousand worlds. Instead, they are people -- just like us -- attempting to do their best in a difficult situation. That is innately heroic, even if the Alphans don't always live up to the best aspects of their nature. And in "Voyager's Return," Jim Haines' impulsive violence is ultimately matched by his capacity to forgive and accept Queller. This is a triumph of the human spirit. 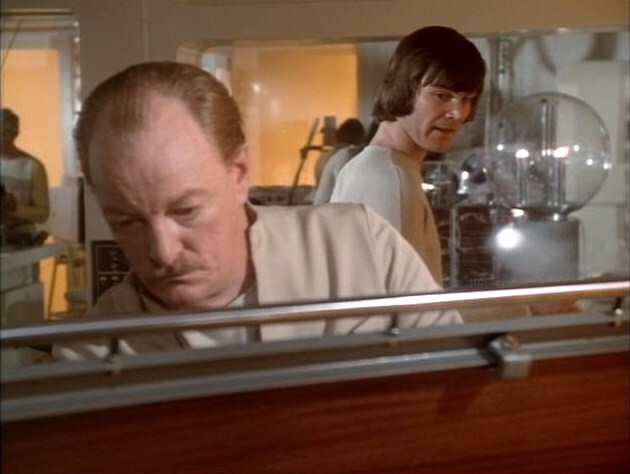 As I've written before, Johnny Byrne often penned Space:1999 episodes based on the events and people he saw in the world around him. In writing "Mission of the Darians" he subtly re-parsed the details of a news story about a soccer team's struggle to survive in the Andes. For "Voyager's Return," Byrne based Ernst Queller on a very well-known man. "Dr. Queller was Werner Von Braun, or someone like him," Byrne informed me. "He created something he believed was good, but it had catastrophic effects. In that sense, he was like all those scientists who created the V-1 and V-2 rockets…his work was used or wicked purposes." Archivist Martin Willey at the impressive Space:1999 site The Catacombs also notes that "Queller was named after Edward Teller, the Hungarian-American scientist known as 'the father of the H-Bomb.'" 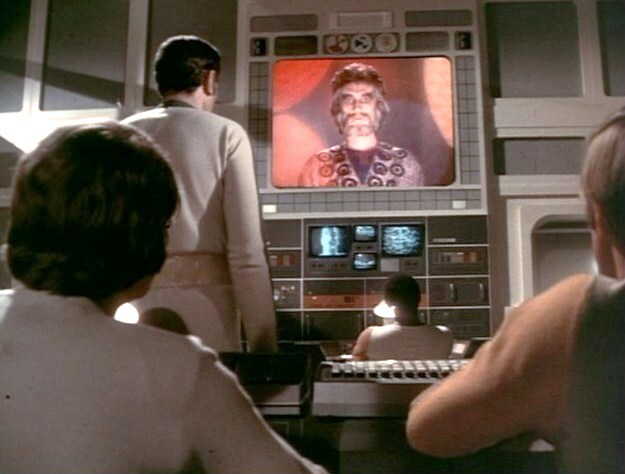 These 20th century men brought terrifying new technologies into the world, and yet Space:1999 evokes sympathy for them as men; as human beings who saw their work perverted. In "Voyager's Return," Queller is a man saddled with incredible guilt and shame, and yet when he has an opportunity for redemption...he takes it. "It was redemption delayed, but redemption nonetheless," Byrne told me. Again, it's a point worth belaboring: a perfect future man doesn't often require redemption...because he doesn't make mistakes. Space:1999's "Voyager's Return" reveals modern man making a mistake on a galactic scale, and shows how his soul pays the price. The Sidons make for an interesting and pointed counterpoint to Queller in "Voyager's Return." They have clearly suffered and have been wronged, and yet their need for "justice" blinds them to the fact that they have set out to murder innocent beings; to commit the very crime of genocide that they accuse the Alphans of. In contrast, Queller set out to kill no one. His engine malfunctioned and people died. The Sidons -- enraged by what they perceive as an attack -- plan to lash out at the innocent and guilty alike with no mercy, and with no sense of reflection about their deeds. Where Queller is haunted by his conscience, the Sidon leader, Aarchon is at peace with his decision to commit murder, and hides behind the letter of the law to do so. Today, "Voyager's Return" remains very dramatic and affecting, in part because of Johnny Byrne's sense of our common humanity but also because of his wicked sense of humor. The episode's teaser is chilling, and amusing, at least in a macabre fashion. Voyager One destroys a manned Eagle in flight, and then announces -- ignorant of an act of murder -- "Greetings, from the people of the planet Earth." This is our greeting to the universe? Fast neutrons spit into space, creating a giant wake of destruction? The moment represents fine gallows humor, but also strongly transmits Byrne's thematic point about technology outpacing human evolution...much to our detriment. "Voyager's Return" isn't often listed as a "best" or "favorite" episode of Space:1999, and it's easy to see why that's the case. It does not feature the mind-blowing alien vistas and cultures of such episodes as "Guardian of Piri," nor the show-stopping special effects of an episode such as "War Games." The episode is not as overtly frightening or Gothic as "Dragon's Domain," nor a chapter in the series' larger story arc (involving the mysterious unknown force). Instead, with real dedication and intelligence, the episode focuses strongly and simply on issues of the human heart. On rage. On desperation. On shame. On forgiveness. These aren't the emotions of a "fantastic future" so much as they are the emotions of today, and such qualities make the program well-worth remembering, even if the less-imaginative among us insist that Space: 1999 is past its expiration date. "Voyager's Return" proves that it isn't. Very insightful review . I agree, not one of my favorite episodes, but always a very watchable one. Jeremy Kemp does a wonderful, understated job as Queller, which for me makes it all the more 'real' when he makes the ultimate sacrifice. "Voyager's Return" is a good, solid episode, and very watchable indeed. I agree with you completely about Jeremy Kemp's performance. I've always liked him in the role, and he gives the ending a real "lift" because he plays such a human character. Every couple of years I consider giving SPACE: 1999 another go, but my opinion of the show hasn't improved. I suppose I'm "less-imaginative," but this episode rang false in many ways. The analysis of Queller and his device was interesting but flawed (even allowing that the device itself never malfunctioned - its lethal side-effect was always inherent). Queller's device only had an impact (in this story) when used as a weapon instead of for propulsion. Even Queller the creator turned to the device's supposedly unwanted destructive capacity instead of its primary purpose to save the day. It never mattered if it could do what it was designed to do, especially considering the aliens were rushing to them. The episode would have resonated much more if he had used it as he had envisioned in order to redeem himself, as well as having Paul Morrow have to work with Quellar instead of the random assistant. As it is Quellar simply justified everyone's mistrust of it/him. To compare the 'malfunctioning' Queller drive to a V-1 rocket or an H-Bomb underscores this flaw, but the show is written to demonstrate it as a weapon first. At one point you say that the "denizens of Moonbase Alpha...don't possess an endless supply of resources." One of the greatest jokes about the series is just that - they never run out of anything. There is a lot of comparison between the Alphans as "20th Century people" as opposed to "perfect future men." I don't believe the Alphans represented 'us' as well as STAR TREK did. I see more humanity in a simple country doctor than in Helena Russell. Somehow the idea is that the TREK characters, by being trained for their positions are not as interesting as the Alphans, who weren't. I think humanity strives to be the best it can, as well as surviving in difficult situations. The problem with 1999 isn't the attitudes of the characters, but the situation we're supposed to accept them in. I have enjoyed your work on other shows (and comments on the Outer Limits a Day Blog), but I guess I'm not the audience for this show after all. Although there are certainly flaws in this episode, I have always enjoyed it, I think for the way that Queller tries to redeem himself. One man cannot be blamed for such a thing as the Queller drive. It took a team of people to put Voyager 1 and 2 together, and to blame one man like this is always rather "scapegoat-ish" in my eyes. It is more of a failing of humanity itself rather than just the failing of one man. I think it is reasonable enough to allow someone like Queller to redeem himself, even if it's for his own selfish reasons. However, Queller's acts in the episode are not just for his own selfish reasons. He tries to save Alpha from the histrionic justice of the Aarchons. To slaughter another race to revenge the destruction of two entire worlds is not the actions of an enlightened, evolved race. So in a way, Queller saves Alpha from injustice which they did not deserve. (1) Queller - a cross between Teller, and Quatermass (?). Quatermass worked for the British rocket programme, Queller worked on the Queller propulsion system.